It's been quite a weekend on the continent. Cristiano Ronaldo scoring five goals, Lionel Messi marking the birth of his second boy with the winner and Inter taking the honours in the Milan derby. Many thanks for your company. Don't forget the Champions League group stage starts on Tuesday. Who's excited? Bye, bye. What next for Roberto Mancini's Inter? It's a second-versus-first early season showdown in Serie A when they travel to face Chievo on 20 September. Will it be four wins out of four for Mancini's men, the only team with a 100% winning record? Eight goals in the last seven Milan derbies now. If you want to see the ball hit the back of the net this is perhaps not the best fixture to spend your hard earned money on. Two defeats in three games for AC Milan boss Sinisa Mihajlovic. Not the start he will have wanted but he will be encouraged by Mario Balotelli's lively substitute performance. The on-loan Liverpool forward has certainly pushed his claims to start the next game at home to Palermo on 19 September. Only one goal but what a match. Inter boss Roberto Mancini is on the pitch patting every one of his players on the back. It's Inter's night in Milan. Inter Milan go top of Serie A. Another free-kick to AC Milan. It's out wide but still in a very good position. It's fizzed in by Balotelli but comes to nothing. Inter's fans have started the celebrations. Backs to the wall for Inter. AC Milan have stepped it up since Mario Balotelli came on but is it too little too late? Late corner for AC Milan. It's whipped in but is adjudged to have left the field of play before coming back in. Groans from their fans at the San Siro. It's been frantic, it's been breathless, it's been absorbing. Are we going to see late drama in the Milan derby? Three minutes of normal time remaining. Mario Balotelli goes down just outside the Inter box. The referee is not interested in awarding a free-kick. AC Milan's fans are staying to the bitter end. They know their side is not beaten yet. Inter boss Roberto Mancini is frantically waving his arms on the touchline. It's that man Balotelli again...what a save by Samir Handanovic to push his swerving low free-kick behind at full stretch. Eight minutes of normal time left but this derby is far from over. Inter are 10 minutes away from going top of the table. Can they hold out? Mario Balotelli looks a different player. He's AC Milan's best hope of an equaliser. What was I saying about Mario Balotelli? He's got the ball at his feet 25 yards outside the Inter box, the forward takes a quick glance before unleashing a powerful strike which smashes against the outside of the post. What's happened to Mario Balotelli? He's been excellent since coming on for AC Milan - hungry, sharp, dangerous. Everything he wasn't at Liverpool. Alex Telles is on for Inter in place of Juan Jesus. AC Milan are running out of time. They're fortunate not to fall 2-0 behind as Mauro Icardi gets in where it hurts to get a header away but it's just wide. Sad sight for Inter as Juan Jesus is carried off on a stretcher after another ugly challenge, this time by Juraj Kucka which earns the AC Milan player a deserved yellow card. Already Inter's players are trying to wind up Mario Balotelli. The on-loan Liverpool forward is involved in a minor spat with Felipe Melo before being ushered away from the scene by his team-mates. Mario Balotelli's last competitive senior appearance? Liverpool's 1-0 defeat away to Hull in April. The 25-year-old lasted 65 minutes before being substituted. Balotelli's last goal was a penalty against Besiktas in the Europa League at Anfield in February. Will he step forward if AC Milan are awarded a spot-kick later? Mario Balotelli's first touch of his second stint at AC Milan is a curling free-kick into Inter's penalty area. It just needs the slightest touch from a red and black shirt and it's a goal but it evades everyone. AC Milan react to falling behind by...sending on Mario Balotelli for Carlos Bacca. First blood to Inter as Fredy Guarin's dispatches a terrific left-foot low finish from just inside the area following an impressive run on the counter. Inter fans celebrate wildly. Are their team on the way to a third straight win? Diego Lopez makes up for his earlier error to push Fredy Guarin's downward header over the bar. The wet conditions are forcing errors from both teams. Another stray Inter pass leads to another attack but Juraj Kucka can't keep the move alive. What a mistake by Diego Lopez. The AC Milan keeper suffers a complete mental block and passes straight to Stevan Jovetic just outside his area. The Inter forward is immediately surrounded by red and black shirts. He tries to create an opening and eventually gets his his shot away...only to see it charged down. No changes by either side. One goal might be enough to settle this but it's still hard to call. It's raining in Milan as the second half gets under way. Out come the teams. Roberto Mancini looks pretty relaxed considering his Inter side were on the back foot for large parts of the first half. I'll be surprised if we see Mario Balotelli early in the second half. AC Milan's attack has caused Inter's back line all sorts of problems. Might be a late substitute appearance for the forward...if he comes on at all. First Milan derby goal for Mario? Mario Balotelli won three Serie A titles and the Champions League during four years at Inter Milan before moving to Manchester City in 2010. He joined AC Milan three years later before joining Liverpool 13 months ago. That said I do think Lee Cattermole would love to get stuck into some of the tackles that were flying in the first half. It's goalless. It's also very entertaining. Will there be a red card? Will Mario Balotelli come on? Will Inter find the goal they need to take them to the top of the table? Lots of unanswered questions.. Huge chance for Inter right at the end of the first half. Mauro Icardi is clean through. Surely he must score? Diego Lopez sticks out a leg and saves the day for his team. Some of the challenges out there belong on a rugby field. Another yellow. This time Keisuke Honda is booked. The referee is the most over worked figure on the pitch. Stevan Jovetic lets fly from the edge of the area and it has Diego Lopez scrambling across his line. Fortunately for the AC Milan keeper it whistles just wide. Alessio Romagnoli is not happy with the referee after a challenge with Stevan Jovetic. The AC Milan players wants his opponent booked but the official in the yellow shirt isn't interested. Moments later Inter's Juan Jesus is booked for a lunge on Juraj Kucka. Inter are trying to carve out an opening a spell of possession but they cannot find a way through. AC Milan are carving out the best chances. Keisuke Honda produces more trickery just outside Inter's penalty box before testing Samir Handanovic with a powerful low drive. How long is this going to stay goalless? Play is briefly held up as Juan Jesus receives treatment. The tackles are flying and there's one or two out there who look as though they are trying to stake a late claim in Italy's squad ahead of the Rugby World Cup. Luiz Adriano's pace is causing the Inter defence all sorts of problems. It requires a stunning tackle by Juan Jesus to prevent the big forward from firing AC Milan ahead. First booking of the game - and probably not the last. Ignazio Abate goes into the referee's notebook for hacking down Steven Jovetic as the Inter forward powered forward. Good point by Zack but both teams are giving this a good go. 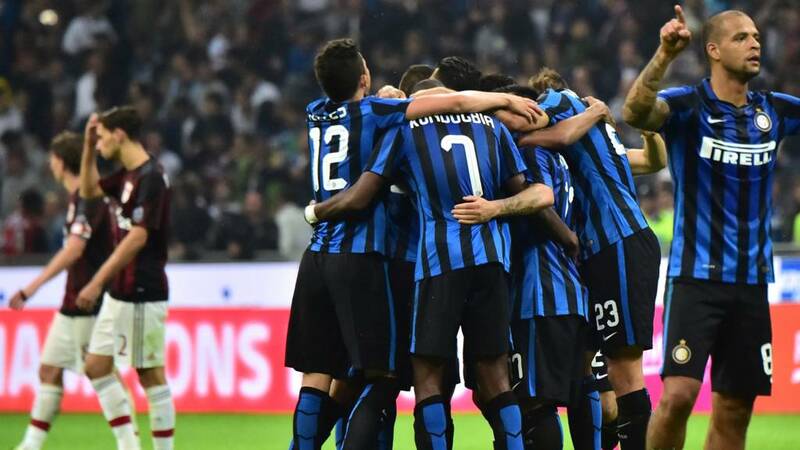 Inter's defence are holding it together under some ferocious AC Milan pressure. Keisuke Honda works an opening on the edge on Inter's area but he can't keep his shot down. Inter's defence is under pressure. The pace of this game has taken many by surprise. It's anything but cagey. Plenty of action in both penalty areas in what is a surprisingly open affair. The TV cameras have just zoomed in on Mario Balotelli on the AC Milan bench. Even he is on the edge of his seat. There have been very few goals when these rivals have met recently but AC Milan should be at least 1-0 up. A very encouraging start by Sinisa Mihajlovic's men. Another chance for Luiz Adriano as he surges into the Inter area but can't keep His effort down while under pressure from an Inter defender. Inter's first chance is a result of a long range effort by Stevan Jovetic which crashes just wide. Lots of nerves on display. That AC Milan chance came as a result of a mistake by Felipe Melo. It's end to end, helter skelter stuff. AC Milan are straight out of the blocks. Samir Handanovic comes to Inter's rescue with a fine save after Carlos Bacca played in Luiz Adriano. Derby day in Milan is under way. What a noise inside the San Siro. Not a spare seat in the famous venue. On one side red and black. On the other a sea of blue and black. Inter Milan XI: Handanovic, Santon, Medel, Murillo, Jesus, Guarin, Melo, Kondogbia, Perisic, Icardi, Jovetic. Subs: Palacio, Biabiany, Telles, Montoya, Ljajic, Ranocchia, Gnoukoun, Carrizo, D'Ambrosio, Nagatomo, Brozovic, Manaj. AC Milan XI: Lopez; Abate, Zapata, Romagnoli, De Sciglio, Kucka, Montolivo, Bonaventura, Honda, Luiz Adriano, Bacca. Subs: Mexes, Suso, Cerci, Ely, Poli, Nocerino, Abbiati, Alex, de Jong, Balotelli, Calabna, Donnarumma. Here's Mario Balotelli showing some tricks before kick-off. Will he make an impact if he comes off the AC Milan bench? AC Milan boss Sinisa Mihajlovic only replaced the sacked Filippo Inzaghi in June but the former Sampdoria chief has already made his presence felt. Mihajlovic, who has overseen one win and one defeat, was critical after he gave some of the reserves a run out in the 3-2 friendly win against third-tier Mantova last week. "We aren't going anywhere if we think that we can win just because we are called Milan," said the former Inter MIlan player. Not even Mario Balotelli, who scored the winning goal, was exempt. "He is not yet in good shape and he has to improve," added Mihajlovic. Is Roberto Mancini reviving the fortunes of Inter Milan? Having taken charge for the second time in November 2014, the former Manchester City manager could only steer them to eighth spot last term. But after a busy summer in the transfer market, City forward Stevan Jovetic one of their many additions, Inter have made a 100% winning start to the Serie A campaign. Is this the season they win the title for the first time since 2009-10? AC Milan have been crowned champions of Europe seven times. Inter three times. Yet both clubs will be missing when the Champions League and Europa League group stages get under way in the next few days. He's played for Inter Milan, Manchester City, AC Milan, Liverpool and now he's back on loan at AC Milan. We want three words you think sum up Mario Balotelli best. Can Inter Milan go two points clear at the top of Serie A? Defeat arch-rivals AC Milan for the first time since December 2013 and they will. This fixture has lacked goals in recent meetings - just seven in the last last six games. Will the presence of Stevan Joetic and Carlos Bacca change that? Breaking team news and all those hoping that Mario Balotelli will start for AC Milan...you are going to be disappointed. The former Inter Milan striker, who re-joined on loan from Liverpool last month, is on the substitutes bench. Inter include forward Stevan Jovetic, who is on loan from Manchester City. It is one of the most watched derbies in the world. Two heavyweights who between them have been crowned champions of Europe 10 times and won Serie A on 36 occasions. Inter Milan and AC Milan might have fallen on hard times in recent years but at least one is showing signs of stirring. Will it be the Nerazzurri or the Rossoneri who will be cheering at the end? It's the Derby della Madonnina and it's not for the faint hearted.